The figure was not included with the game, I just so happened to pick this up sometime. 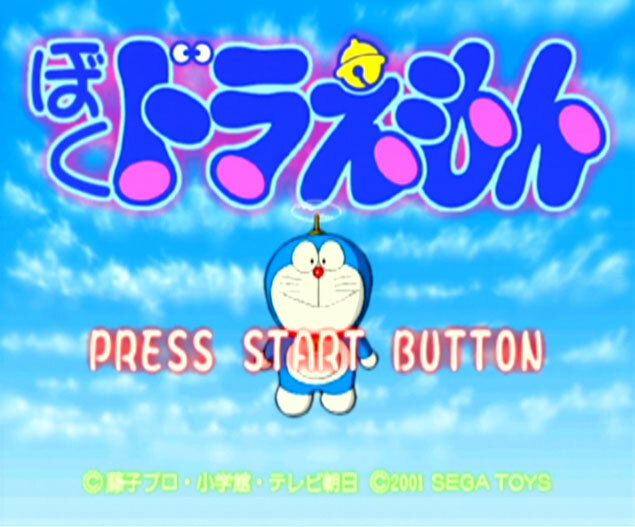 I have never watched this anime so don't know a whole lot about it, other than that it has a really catchy theme tune, stars a robotic cat (that barely resembles a cat) with a magical front pocket/pouch, and had it's ears torn off by mice which made him apparently cry himself blue. Ok then. 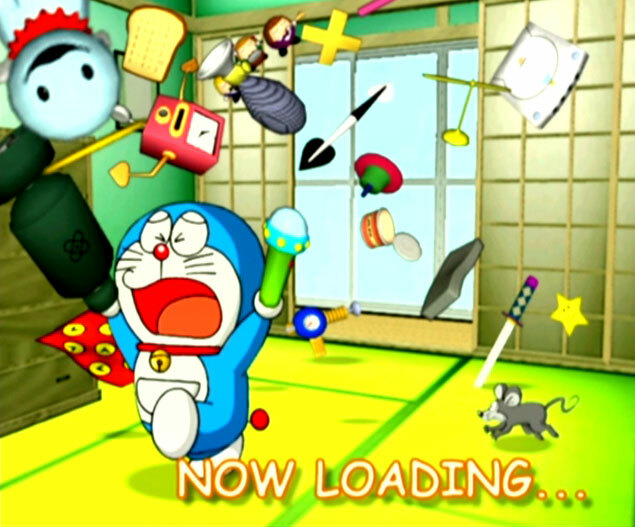 He really doesn't like mice, He's even got nukes, swords and his Dreamcast out to shoo it away! He hangs out with a kid called Nobita who comes across as a bit of a Japanese Milhouse or Charlie Brown to me, always moping and pleading for help from Doraemon, at least if this game is anything to go by. 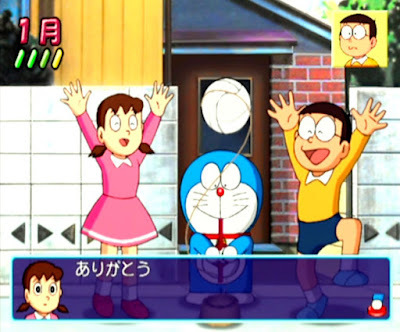 There's also a bunch of kids he hangs out with, another yellow girl earless robot cat, and Nobita's mother who just like Milhouse's mother looks almost identical to him. Family genes eh? Boku Doraemon is noteworthy for being developed and published not by SEGA but by their off-shoot company SEGA TOYS. This side of the Sega-Sammy coin is responsible mainly for, you guessed it - toys, with their biggest claim to fame being the Sega Pico, which they took over and kept going for many years in Japan, making it the longest running Sega brand ever! This even resulted in Pokemon games being developed for it, along with a limited edition Pikachu system. A Picochu, if you like. Chortle. Technically a Nintendo game on a Sega console. What a world. On a few very rare occasions they developed games for consoles, twice of which were on the Dreamcast: Bikkuriman 2000 (a game I may come back to some time to talk about) and Boku Doraemon. They are so separated from the video game side of Sega these games are considered to be third-party. Ooh er. 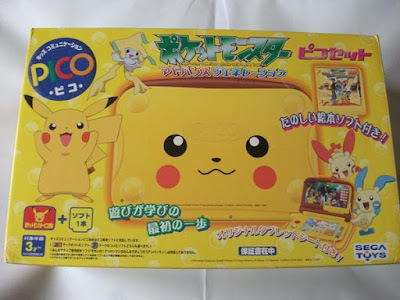 Also according to the Ultimate Collectors Guide this game was at some point recalled? Not entirely sure why, if anyone knows leave a comment below. Either way it's not super rare but I did have to pay for it a few years back. There was also a rather neat platformer of this character on the Mega Drive, in which the cat sings 'SE~GA!' on boot up. 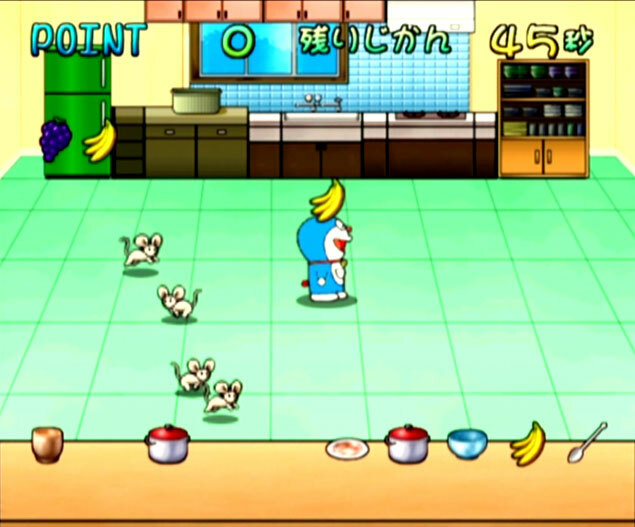 Unfortunately this Dreamcast game is not a platformer. In fact, I'm not really sure what you would call it, but it is quite interesting nonetheless. Speaking of which I should stop rambling and get to the game itself, right? 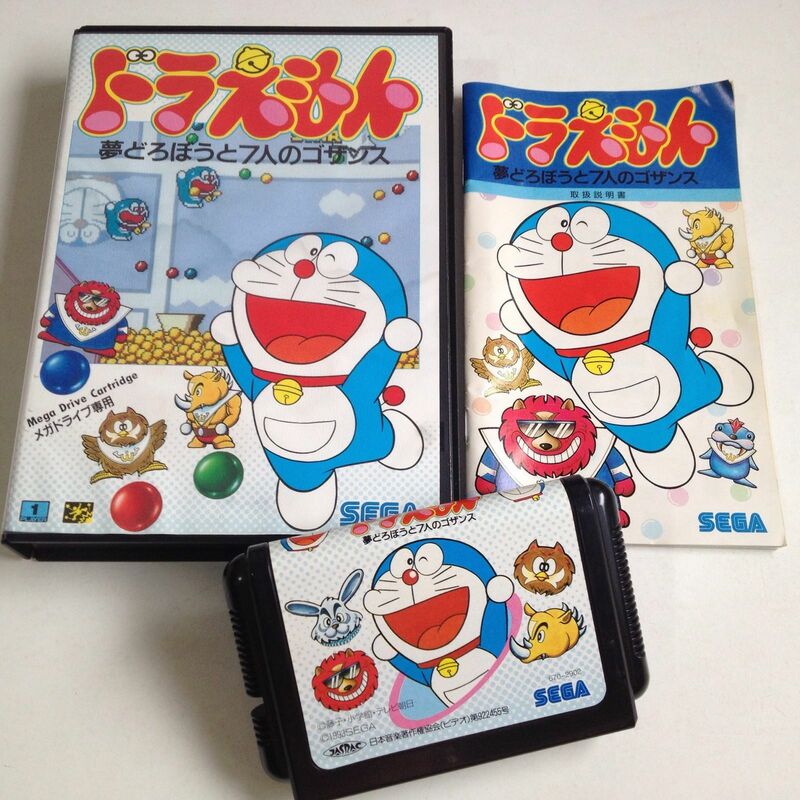 The Mega Drive game in question. They also made a lovely box set with a pencil case and ruler which is super expensive. So if I had to sum up what this game is, I'd maybe describe it as a really, really, really simple Shenmue-like where you have days to spend doing mostly what you like and maybe occasionally moving the plot along. I think. Yeah. 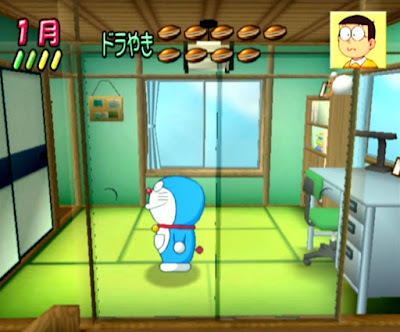 Each day you start standing in the middle of Nobita's room. There doesn't appear to be a in-game clock, days tend to pass once you have done something significant. In here you have a draw you can open (that has yet to ever have anything in it), a bed in a cupboard that you can sleep in to skip to the next day (and you can do this at any time) and a door to explore the rest of the house. 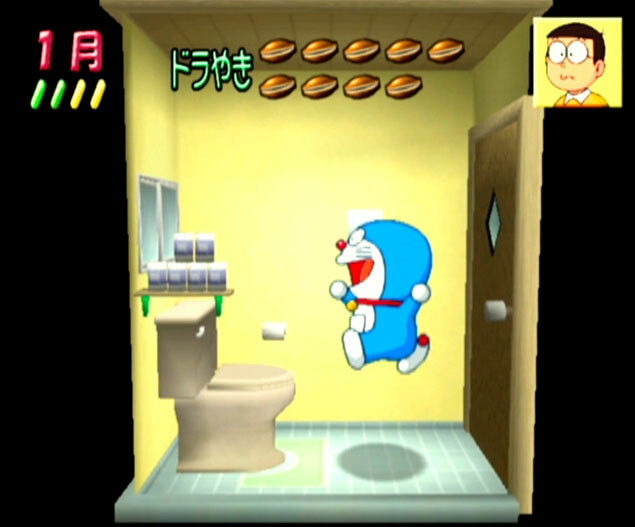 I can jump up and down next to a toilet! What more could you want from a video game? Every room of the house is nicely detailed and explorable but unfortunately there is not a whole lot to explore: every room is mostly empty, as if the family have only just moved in and got their furniture in but have yet to receive their boxes of stuff. 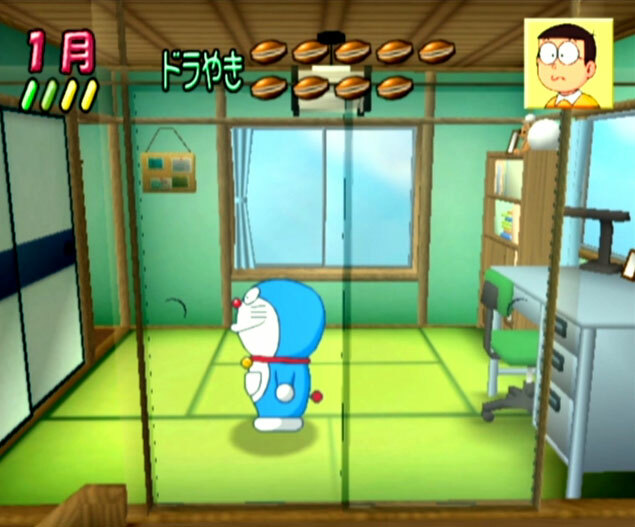 The room opposite Nobita's literally has nothing in it. You can walk about in the bathroom, the toilet room, and everything else but so far none of them seem to result in anything happening. The exception being the kitchen, where Nobita's mother (according to the manual just known as 'Mama') is always standing, doing nothing. If you talk to her you get to play one of three mini-games, or 'chores' for the cat to do. One of them has you running around garden pulling weeds out by holding A and wiggling left and right while avoiding mice that scatter about. Remember they tore off his ears? Now they want the rest of him. If they touch Doraemon he cries about bit, but luckily doesn't lose any more appendages. 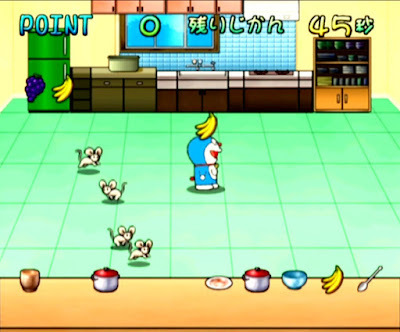 Another mini game has you sorting out the kitchen. 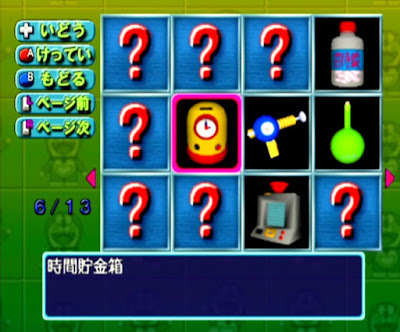 There's a fridge, sink, stove and cabinet and items will be shown where they go for a few seconds, then you have to remember where they go and take them from the bottom of the screen to the correct place. Once again, there are mice running around everywhere. Bloody hell, I can maybe understand out in the garden but in the kitchen too? Doraemon is a useless cat isn't he? "Put some welly into it! These shoulders won't soothe themselves!" 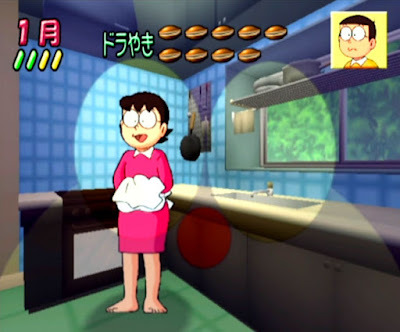 The third mini game is perhaps the strangest depending how you look at it: you have to give the mother a massage by patting her shoulders back and forth. This is done by pressing A and B in time with the bar shooting left and right, and you have a meter that keeps track of how happy the mother is. Why is she getting the pet robot cat to do this? I have only ever seen Nobita's father once in the house for a quick cut scene, is she that sexually frustrated? I'm obviously looking far too much into it. This mini game eventually gets so fast it's hard to catch up with it. 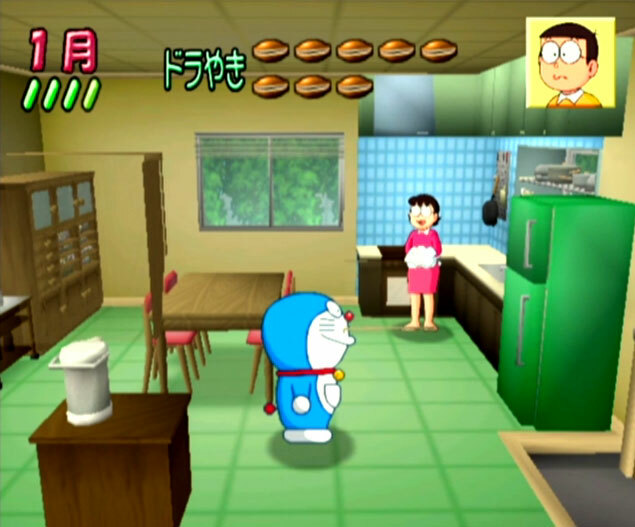 Beating any of these mini games will earn you some Dorayaki's, Doraemon's favourite snack, and you can get up to four of these depending on how well you do. These come in handy as you need them as travelling snacks. That's right; you can leave the house! This is a Dorayaki. It's red beans sandwiched in pancakes. 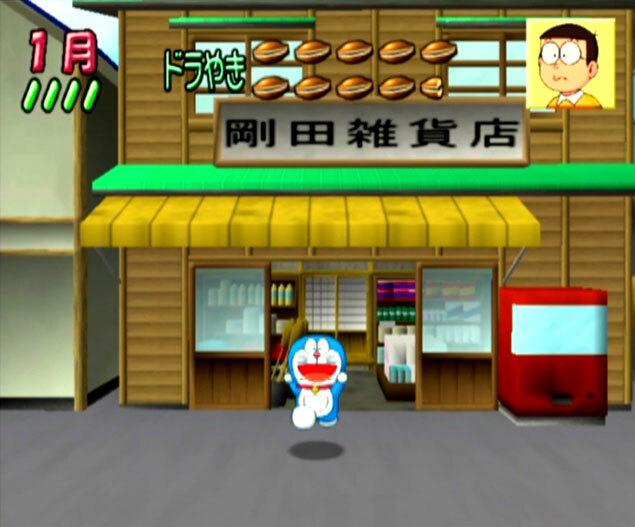 Doraemon is famously obsessed with them. I wanna try one. There are six other locations to visit: a school, another kid's house, a park, a forest, a shop and a street cross-road. 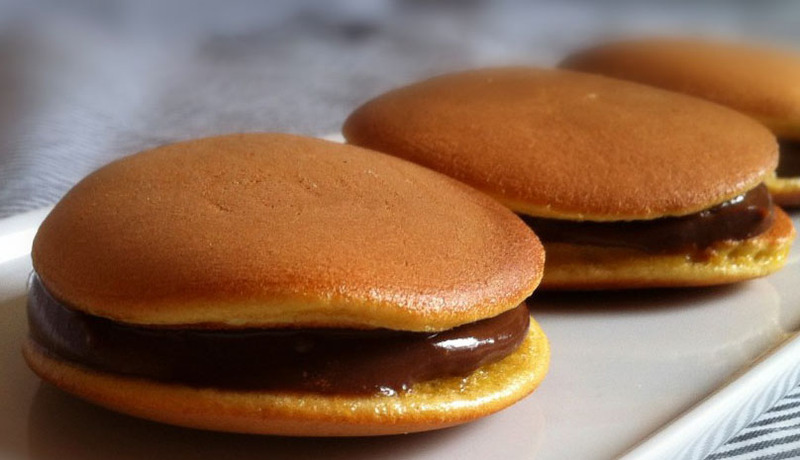 You can walk to them, which will make you consume half a Dorayaki each time. Alternatively you can use your helicopter that pops out of your head (did I forget to mention he's a robot?) or use a teleporting door to save using up Dorayakis, though you can use these up to five times each and they recharge at a rate of one go each a day. "Why is there never anyone here? Not even a shop keeper?" Unfortunately these other locations, at least so far for me, have been even more limited than the house is. 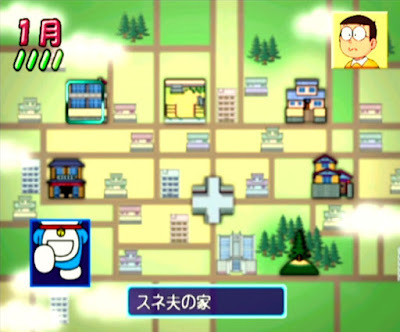 You can not enter any of the buildings, having only a very limited space of the pavement or road to walk about on, often hitting invisible walls. 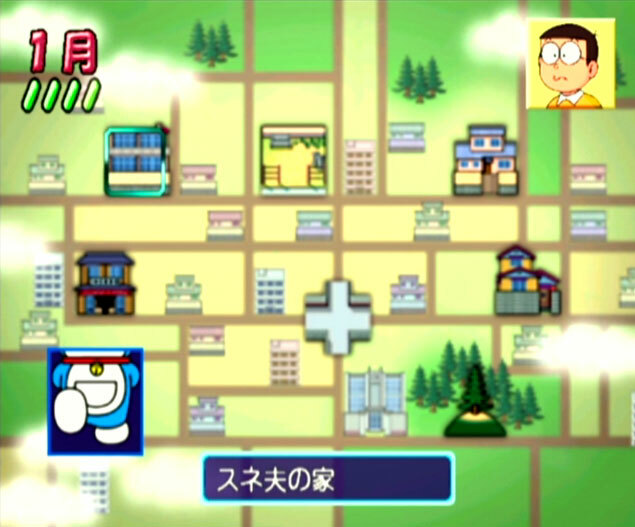 Sometimes, if you're lucky or can read Japanese to know where to go, you will bump into Nobita. He is almost always in a tizz about something and requires your help. 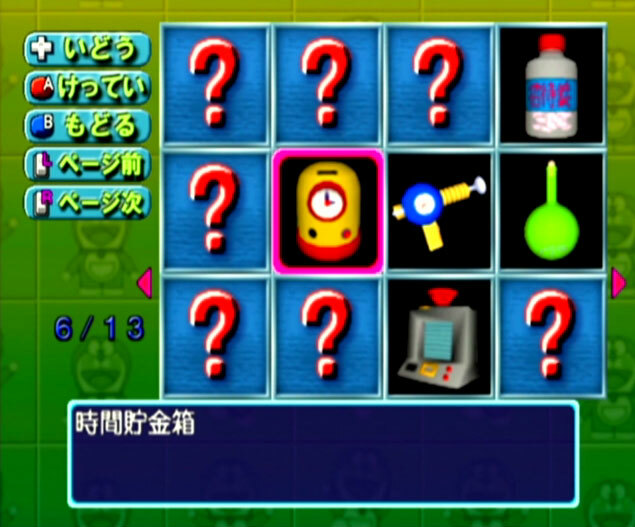 Doraemon's answer is to give him one of three items, which you have to pick from. These seem to range from lipstick to toy cars to capsules full of pills?? I have no idea. 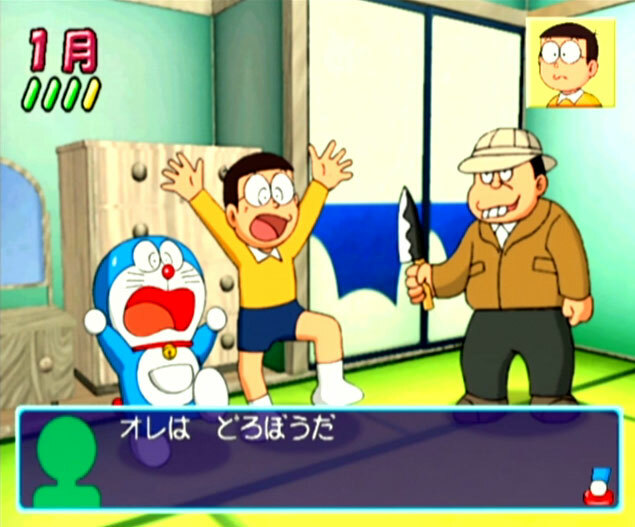 Depending on what you pick Nobita will either find the item handy and smile or find it useless and frown. Sometimes he will run off with the item, and you will find him back home in his room where he will thank you for the item or shout at you. Not knowing the lingo I seem to keep making him miserable, though his default expressions seems to be a gormless 'meh' attitude anyway, and that mug of his is in the top right corner of the screen all of the time! All the items you suggest get unlocked in a collection screen where you can spin them around in 3D while Doraemon shouts out what they are. 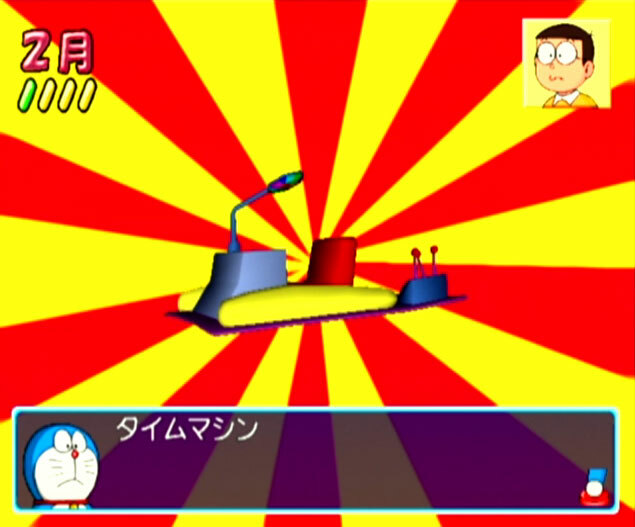 Doraemon's voice is very amusing, especially when he says words borrowed from English like TIMEU-MA-SHEEEEEN. Sometimes events will happen. One day I got a time limit to go somewhere, but of course I had no idea where I was needed so I failed that, though I did find out that flying or teleporting gets you to places quicker than walking, of course. I also had one day where we took a time machine to some time in the past (maybe the early 1900s? 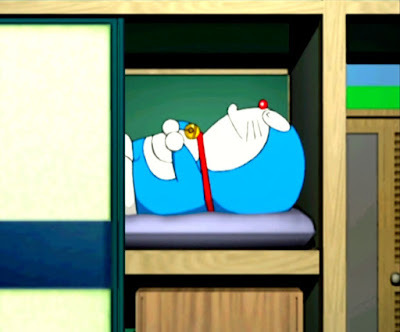 I couldn't tell) where Nobita ended up getting muddy, then appearing in just his pants, then for some reason he had long hair, then he was in a girls dress, then a boy came over and gave him a chocolate bar, then we went back to the future and Nobita was happy. It feels like pure luck finding characters in the locations. Again the language barrier is probably stopping me from getting the most out of this, but it's still interesting when events do pop up. While grabbing screenshots this happened! They managed to tie him up in a skipping rope so that's ok.
One thing I forgot to mention is that you can go into a first person view. It's a bit spooky as you can see a semi-transparent Doraemon face as if you are wearing a mask. You can look close up at things like the toilet and look around corners you normally cannot see like never ending alleyways, but that's pretty much all there is to it. 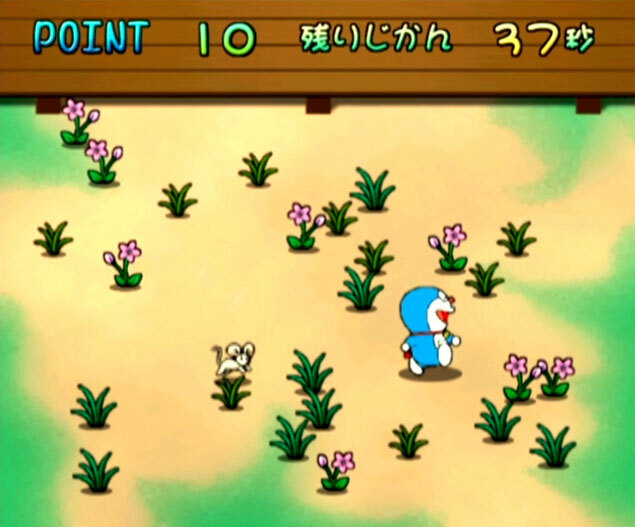 You can also do a cute little jump, but again so far it has served no purpose. 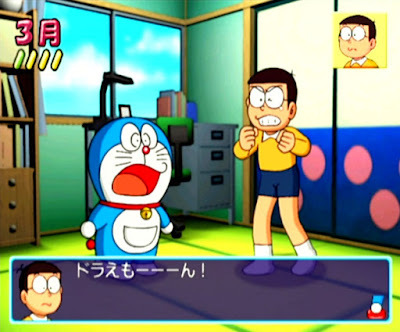 So that's Boku Doraemon! There is no online guide for this game anywhere yet so I guess I'm gonna just keep poking around in it to see if anything else happens. Maybe if I reach a certain date I will get killed by Lan-Di and get a bad ending? Who knows! Whatever the case, at the very least it has lovely presentation with huge sprites on 3D backdrops and nice cheerful music, and is just mildly fun to mess around in even if there isn't a whole lot to do.